Today is the FATHER'S DAY. 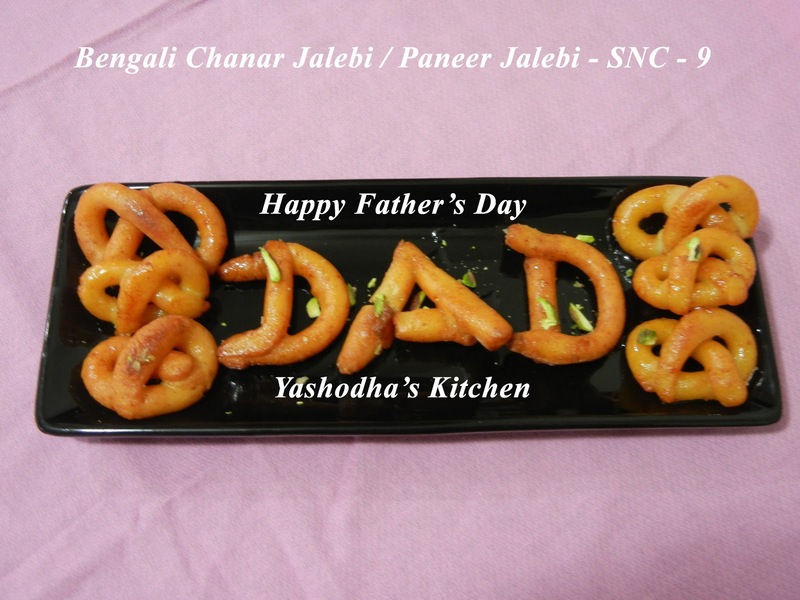 I gave this special treat to my DAD. 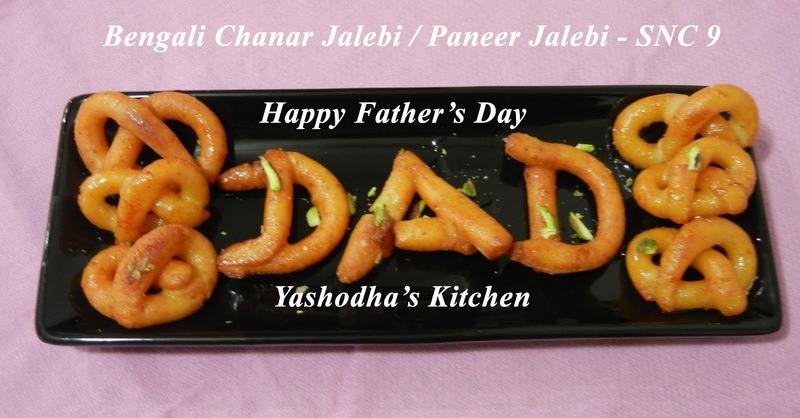 Anyone can be a FATHER, but it takes someone SPECIAL to be a DAD like you! I am going to repeat the same story. Please don not think that I am boring you all. Just for spreading SNC to the blogosphere, I am repeating the same. It will be helpful to improve our SNC TEAM. Motive of the SNC is to learn different regional food recipes from our co-bloggers. 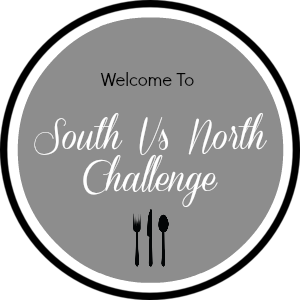 Every month one member from north team challenges the south team and one member from south team challenges the north team. We have sufficient time to finish the challenge. Every month 1st, they post the challenges and we have time to finish it off until the end of the same month. 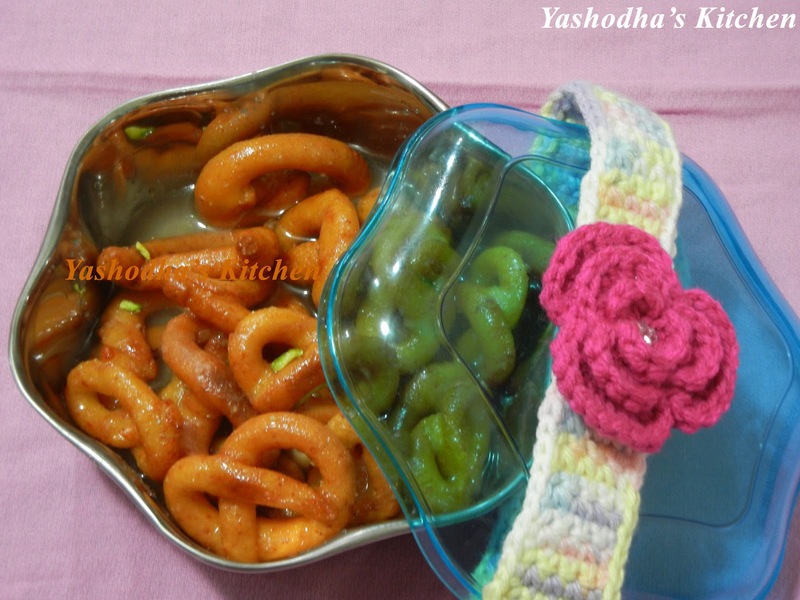 Divya pamil allotted some points for the recipe posts. According to that, the winning team will be announced by her around second week of every month. If you would like to participate in this event, please contact divya.pramil@gmail.com. She will help you definitely. It is a bangali dessert which is made up of fried paneer with some ingredients coated with thick cardamom flavored sugar syrup. All of them are made this dessert using fresh paneer, but due to my health issue I could not do lot of works. But I was not participated in the SNC challenges for the past 5 months. I am really feeling guilty. SO I made this dessert bit different from your original version. For sugar syrup, add all the ingredients and mix well. Microwave it for 4 minutes. Stir every 1 or 2 minutes. Sugar syrup is getting ready. Keep 1 or 2 more minutes or until it becomes neither thin nor thick. It should be in the sticky consistency. For jalebi, add all the ingredients except oil in a pan. Mix all the way until the paneer becomes soft and smooth. Take a small part from the dough, make it to a ball, roll it to a long tail, shape it like pretzel or your desire shape. Do the same for all the dough. Keep oil in a pan with medium flame for deep frying. 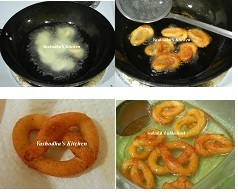 Fry all the jalebis until it becomes golden color. Put them on the paper towel for few seconds and immediately shift all of them into the thick sugar syrup. Garnish them with pistachios and almonds. Bengali chanar jaliebi came out very well. I am an ardent lover of sweets. It is a delectable dessert and my extreme thanks to Chandrani from Cuisine Delights for introducing this wonderful delicious recipe. I am going to link this recipe in the Chandrani's space for SNC - 9. Wow! 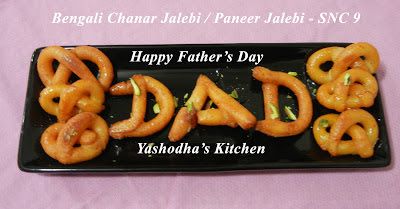 Yummy,Nice post,wishes to your dad. beautiful presentation.loved the first click.